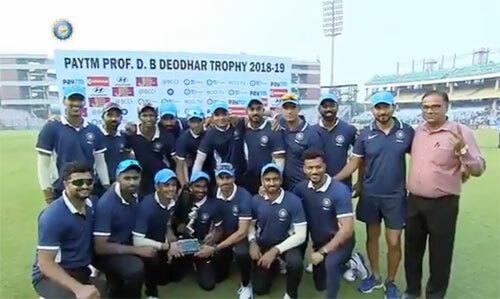 Ajinkya Rahane's patience trumped Shreyas Iyer's flamboyance in a 'battle of captains', leading India C to the Deodhar Trophy title triumph with a 29-run win over India B in New Delhi on Saturday. In reply, Shreyas Iyer hit eight sixes in his 148 off 114 balls, but India B finished on 323 in 46.1 overs. Iyer's hundred was easily the best of the three tons but lack of support from the other end hurt the B team captain as he fought a lonely battle for the better part before getting dismissed by leg-spinner Rahul Chahar while trying to slog sweep. The match saw a heated moment as Rahul Chahar gave him a send-off and Iyer was seen angrily charging towards him. However, things were under control shortly. The most significant stand was the 116-run partnership for the second wicket with Ruturaj Gaikwad (60). India B were cruising along at one stage with Iyer and Ankush Bains (37 off 31 balls) adding 65 runs for the fifth wicket. Once Bains was sent back by left-arm spinner Pappu Roy (3/75), things started to get difficult. However, Iyer, continued to attack the C team bowlers during his 46-run seventh wicket stand with Deepak Chahar (21). Opting to bat, Rahane shrugged off his poor form and focussed on building his innings as he let Kishan take the opposition attack to the cleaners. Kishan's innings had 11 fours and half a dozen sixes while the Indian Test vice-captain hit nine fours and three sixes. Save Jaydev Unadkat (3/52), who used variations to good effect on a batting track, the other B team bowlers leaked a lot of runs. Leg-spinner Mayank Markande (2/70 in 9 overs) and left-arm spinner Shahbaz Nadeem (0/62 in 10 overs) couldn't stem the flow of runs in the middle overs. Kishan suffered due to poor umpiring as the ball was clearly missing the stumps. Rahane scored at less than run-a-ball but Suryakumar Yadav's 18-ball-39 helped the C team notch up a winning score. Brief Scores: India C 352/7 (Ajinkya Rahane 144 no off 156 balls, Ishan Kishan 114 off 87 balls) India B 323 all out in 46.2 overs (Shreyas Iyer 148 off 114 balls, Ruturaj Gaikwad 60, Ankush Bains 37, Pappu Roy 3/75). India C won by 29 runs.